Attention citizens of Earth dimension... uh, which dimension is this one again? Anyway, all you lower carbon-based life forms down there. 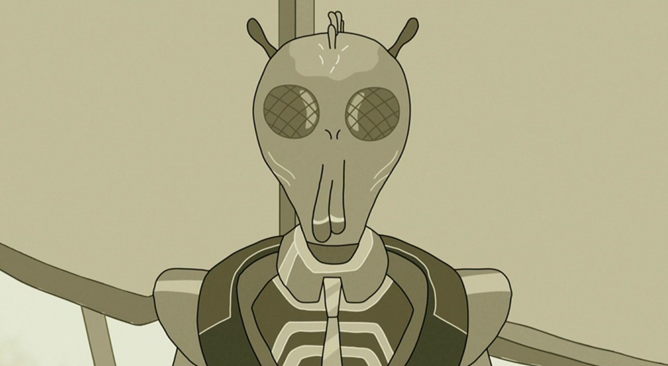 This is Archie Florboops the 68th, the sector representative of the Galactic Government, and I have a very important announcement to make. By the way, life on other planets exists. Try not to let it distract you. It's come to our attention that a Meeseeks Box, the invention of inter-dimensional criminal Rick Sanchez (dimension C-137) has been used at this location. Meeseeks Boxes are not illegal, despite the fact that they summon a constantly-suffering and insufferably cheerful sentient being who lives in pain until the fulfillment of a sole task, after which it dies. (The Galactic Government is informed that they are "fine with it.") The application of this technology is currently under review by the Ethics Committee of the Galactic Government's Interplanetary Trade Commission, and a recommendation to issue a guideline for a referendum to proceed to a possible judicial decision is expected sometime in the next six hundred standard cycles. The user presses the button on the Meeseeks box. Mister Meeseeks manifests from the ether. The user makes a request of Mister Meeseeks. Mister Meeseeks fulfills the request. While hard-working and generally affable, Mister Meeseeks are not imbued with any extraordinary powers or abilities. Do not make requests of Mister Meeseeks that cannot be granted by normal bipedal creatures, and do not select tasks that take inordinate amounts of time or effort. Do not, under any circumstances, create multiple Mister Meeseeks at a time. Some tasks that Mister Meeseeks can complete include removing the lid from a jar of mayonnaise, making you more popular at school, and making you a more complete person. Tasks that are beyond the power of Mister Meeseeks include destroying planets or other solar bodies, reversing time, and taking two swings off your golf game. For an excellent example of the proper operation of a Meeseeks Box, refer to the following instructional video from phone skin maker and occasional rap battler dBrand. It's a guide on how to apply a thin vinyl covering to one of your primitive communications devices. For the relevant section, skip to 5:40. If you'd like to acquire a dBrand skin for your Nexus 6P, go to this address. At the moment it looks like skins all over the site are discounted. Meeseeks Boxes are currently out of stock. Again, it's vital that users refrain from asking impossible tasks of Mister Meeseeks, allowing them to exist for more than a few hours, or creating multiple Mister Meeseeks at once. Trust me, you don't want to get roped into that. Residents of this planet are reminded to contact Galactic authorities if they see Rick Sanchez or his associates Morty Smith (dimension C-137), Birdperson (Bird World), or Squanchy (Squanch). This has been Archie Florboops the 68th, and from all of us at the Galactic Government, thank you for your time.